If you’ve kept up with our blogs, it comes as no surprise that we love the New Parkway Theater. This Monday, start the week off right with the 20th Annual Animation Show of Shows. That’s 98 minutes of award-winning, animated flicks from all over the world, all for the price of one ticket! What better way to unwind after your first day back at the office? Feeling artsy? San Francisco’s de Young Museum is a landmark art museum that showcases the museum’s priceless collections of American art from the 17th through the 20th centuries, and art of the native Americas, Africa, and the Pacific. Normally admission is $15 for adults, but on the first Tuesday of every month, admission is free! Following your midweek happy hour drink, head on over to Books Inc. for a meet and greet with life and leadership success strategist, Nicola Ries Taggart as she shares her essential workbook, Calm the Chaos Journal: A Daily Practice for a More Peaceful Life. Her daily journal helps calm inner chaos by inviting users to process "Today" and look ahead to "Tomorrow." Sign me up. Shotgun Players presents “Women Laughing Alone with Salad”. As if the show name isn’t enough to hook you, learning that the show’s inspired by an internet meme ought to do it. This show closes November 18th, so be sure to see it while you can! Find your #FridayFeeling. 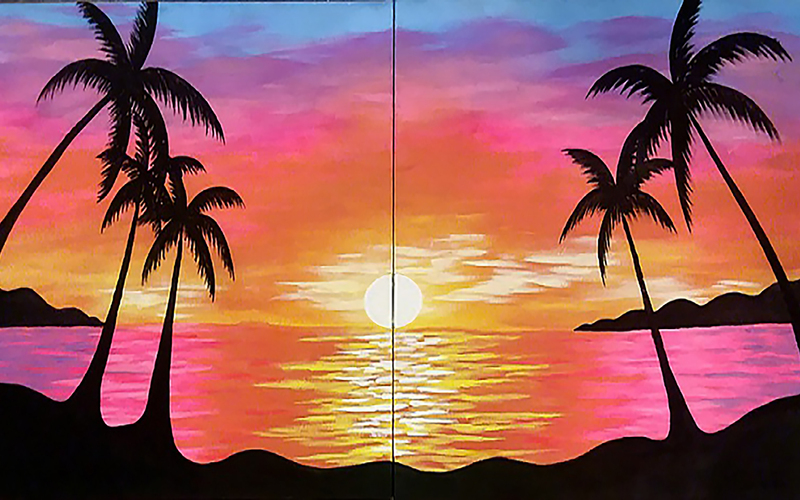 The setting sun bathes this tropical paradise in a beautiful array of colors. Date Night Paintings: 2 people+2 canvases = 1 painting. You paint half, I paint half. Make sure you let us know your painting partner. (Both painters must register.) If you come solo, just turn your canvas horizontal. Spend your Friday evening sipping local brew and rocking out at Almanac Beer Co. Tonight’s entertainment, aptly described as “knock-out 70s-style boogie rock", is The Honey Wilders. This ensemble comes strongly recommended for rockers and “power-poppers” who like to get down and get with it – isn’t that what we all need on a Friday night? It’s the second Saturday in November and you know what that means… Second Saturdays at Jack London Square. Second Saturday, true to its namesake, is held every second Saturday of the month. This family festive event will have everything. Showcasing up to 60 vendors, this monthly gathering will also feature live entertainment and food. This Sunday marks the third annual Punk-Metal Flea Market at Oakland Metra Operahouse, hosted by Savage People. There will be music, there will be vendors, and the best news of all – it’s a free event, open to all ages! Come shop ‘til you drop (and maybe fit in a little rock in between).